We’ve previously reported on My Hero One’s Justice‘s vague October release date, saying, “[Though] no concrete release date has been given, fans won’t have to wait too long to duke it out as their favorite My Hero Academia characters.” Well, prolific anime publisher Bandai Namco Entertainment has given a concrete release date, announcing via press release that My Hero One’s Justice will launch on October 26, 2018. 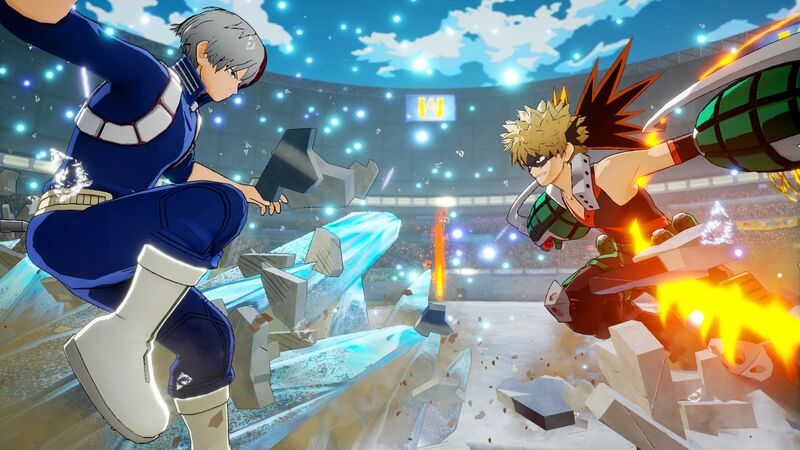 And with it, a short new trailer showing some gameplay and expected heroes and villains – like Izuku Midoriya, Katsuki Bakugo, Ochaco Uraraka, Shoto Aizawa, Shoto Todoroki, Chizome Akaguro (Hero Killer: Stain), and Tomura Shigaraki – has been released. You can watch it above. In addition to the release date news, Bandai Namco has announced three new playable characters: Gran Torino, Muscular, and Endeavor. We’ve already known Gran Torino and Muscular were going to make an appearance in the game thanks to the Weekly Shonen Jump reveal, and Dabi and Himiko Toga will both appear in the game as well, but Endeavor is a completely new reveal. Unfortunately, the Flame Hero is only available to those who preorder My Hero One’s Justice. My Hero One’s Justice will be available on October 26, 2018 for Nintendo Switch, PC, PlayStation 4, and Xbox One.